Sun Lakes is an active adult community located in Banning, California. Thanks to the presence of Interstate 10 just to the north of the development, it is easy to travel Palm Springs to the east and Los Angeles to the west. This high desert community in Riverside County includes over 3,000 residences that were built between 1987 and 2003. Those with Sun Lakes homes enjoy meticulously manicured grounds featuring many bright flowerbeds. Avid golfers that own Sun Lakes CA homes and their guests can enjoy a fine golf complex right within the community. The Presley Corporation created the community in the 1980s. The development was later sold to the Pulte Corporation, and construction was completed in 2003. Golfers with Sun Lakes properties enjoy access to memberships in a championship layout and an executive course. The par-72 Sun Lakes Course stretches to over 7,000 yards from the back tees. Water hazards, contoured bunkers and undulating greens will challenge the dedicated golfer. At the same time, beginner golfers and those that want to enjoy a quick round can tee it up on the par-60, 18-hole Executive Course. 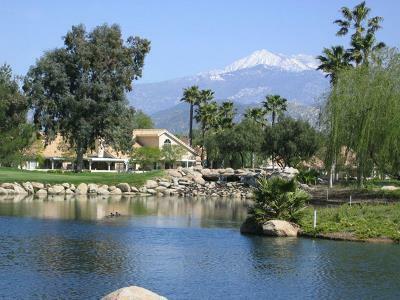 Golfers enjoy the ever-changing views of the San Jacinto and San Bernadino Mountains. There are three clubhouses that cater to the recreational and fitness needs of the residents. The primary clubhouse offers a state-of-the-art fitness center, fine dining, library and veranda. Don't miss the Sunday champagne brunch. The lounge frequently features live music. The other two clubhouses also include fitness centers along with indoor pools and outdoor pools. Tennis courts, bocce ball courts and pickleball facilities add further to the recreational opportunities. Additionally, miles of hiking and biking trails meander through the thousand-acre development. Many scheduled classes address the divergent interests of the residents of the Sun Lakes community. Partake of the yoga, aerobics and/or weight training classes. In addition, there are clubs that cater to those that love bridge, poker, chess and/or billiards. The artistic resident can consider participating in ceramics, quilting, sewing or china painting experiences. Those with musical or theatrical interests can consider the choral groups and performing arts clubs. Those that want to take to the dance floor will find clubs that cater to their interests as well. The prospective Sun Lakes home buyer will find many Sun Lakes homes for sale affordably priced between the mid-100s and the low-300s. Homes range in size from about 850 sq-ft to about 2,600 sq-ft. Some residential Sun Lakes real estate will be in close proximity to the 36-holes of golf offered here. Some of the homes for sale in Sun Lakes will afford their owners wonderful scenic views. It can be wise to enlist the assistance of Carolyn Burton, a capable Sun Lakes Realtor, when perusing the real estate in Sun Lakes. Carolyn Burton can save you a great deal of time by efficiently matching your important needs to the available Sun Lakes CA real estate.